There is so much to do in the Salzburg that we could easily spend weeks wandering the cobbled streets. Even though Salzburg is a little smaller, you’ll be just as entertained here as in any city in Europe. It is such a cool city that you could do the exact same activities in each of the four seasons and get a uniquely wonderful experience each time. The further you get down our list of the top ten things to do in Salzburg, the more you’ll love it here. The sights are quite diverse from Mozart and the Sound of Music, to beer halls and holiday festivals. To see all of our top ten things to do in Salzburg you will have to do a little bit of planning, but we have laid out great guides to help you do that. Because the city is so compact, visiting all of the best sights on a short visit is very doable. Prioritizing based on your interests and following our free walking tours will help your planning a lot. We hope you love the sights on Salzburg as much as we do! Related Article: Suggested Itineraries For Salzburg. About Mozart’s Birthplace: On January 27th, 1756 one of the true pioneers of Classical Music was born in this very home, Wolfgang Amadeus Mozart. You simply can’t miss the house with its bright yellow facade and large tourist groups milling around the entrance. This is by far the most visited Mozart landmark in Salzburg. Inside are three stories of exhibits that cover Mozart’s family, his time as a composer of operas, musical instruments, and his normal day-to-day life. The museum also has a ton of opera set models and costumes, plus excerpts from Mozart’s most famous operas for you to listen to. The delightful museum only takes on average 90 minutes to tour and it will give you great insight into Salzburg’s favorite son. Featured On: (Old Town Salzburg Walking Tour). About The Sound Of Music Sights: While Mozart may be Salzburg’s most famous resident, the film locations from The Sound of Music attract just as many tour buses. Soon after the hit movie about the Von Trapp Family was released in 1965, tourists started lining up to see the locations featured in the film. Playful fountains, Alpine backdrops, beautiful gardens and historic sights all make appearances in the magical movie. Some of our favorite stops include the Dwarf Garden, Sound of Music Gazebo, trick fountains, and lakeside Leopold Palace. Whether you choose to walk or bike between the stops, you’ll have a ton of fun belting out the songs from the Sound of Music while re-living the scenes. We easily could have filled half of our top ten things to do in Salzburg list with Sound of Music sights, they are that cool. Featured On: (Sound Of Music Walking Tour). About The High Fortress: Since 1077 AD, this fortress has been towering over Salzburg from Mönchstein Hill, offering an ever-steady sense of protection. Hohensalzburg is one of the largest fortifications in Europe and one of the only ones never overtaken. Self-guided tours include the royal apartments, staterooms, plus amazing views of both Old Town and the Alps! One of the most popular areas are the Medieval rooms with one of the most decorative stoves you’ll see in Europe. About Saint Peter’s Abbey: Beautiful painting-filled Saint Peter’s Church is home to nightly Mozart concerts and the Stiftskeller Restaurant which is widely considered Europe’s oldest restaurant. Charlemagne himself even ate here back in 803 AD. Behind the church, a serene cemetery filled with pansies and a waterfall may be the most peaceful stop in Old Town Salzburg. The beautiful cemetery goes back to 700 AD with underground catacombs that go back even further to 215 AD. The oldest headstone at the cemetery is from 1288 AD and it is also where Mozart’s sister Maria Anna is buried. Saint Peter’s is definitely a cemetery for the wealthy as you have to continually rent your plot. If your family ever stops paying after your death you lose your spot. It is here where the Von Trapps hid from Nazis in the movie The Sound of Music although the actual scene was filmed in Hollywood. About Getreidgasse: Getreidgasse is an amazing Medieval shopping street. While there are a bunch of cool stores to visit, we suggesting stopping by the active blacksmith for a demonstration and the Sporer Schnapps Pit Stop for a drink. There is even a fancy McDonald’s on Getreidgasse where they give you a real plate and silverware. You can really see the Medieval roots of this compact pedestrian street by the signage that hangs above each shop. In the Middle Ages, almost no one could read so instead of having signs with business names on them, the shops would hang an icon for their trade or craft. Notice how the signs for the hat maker, locksmith, umbrella shop, and many more stores have kept this signage tradition alive. About Salzburg’s Festivals: Salzburg is always a lively city, but its full personality shines through during its annual festivals. While every holiday and season seem to have its own activities, our favorite events are the Salzburg Festival, Rupertikirtag, and the Christmas Markets. The Salzburg Festival in August is great not just because the weather is perfect, but because they show outdoor movies at night in the square. We also really love Rupertikirtag which happens at the end of September which feels like a mini Oktoberfest. If you are in Munich for Oktoberfest and want an escape from the 120,000 daily visitors, it is only 90 minutes to Salzburg. Their festival is far less cramped than Munich and still very fun. Many towns in the region have had their own Fall harvest festivals for hundreds of years. Like most towns in Central Europe, the Advent season is also huge in Salzburg. Shopping at the delightful Christmas Market stands during Advent is great in Salzburg because the town just feels cozy. There are also some other twists throw in that are surprising to American tourists. The two things that stand out to us are the gold Christmas angle and the scary costumes symbolizing Krampus. In Salzburg, there are many regional traditions, including some old pagan ones, that are incorporated during the Advent Season. About The Mirabell Palace Gardens: The Mirabell Palace Gardens, which opened in 1730, offers some of the best views of Old Town Salzburg. Filled with flowers and fountains, the grounds are laced with scenes from the hit movie The Sound of Music, especially from the song ‘Do Re Mo’. You’ll recognize the Pegasus Fountain which the children danced around and the nearby steps they used as a musical scale. You’ll have a ton of fun taking photos in the Vine Tunnel and Hedge Maze while you explore the grounds. Make sure to visit the Gnome Garden which is filled with statues that were all originally modeled after real-life dwarfs. Each of the statues are fun, but the one wearing glasses on was the one that all of the Von Trapp kids patted on the head during The Sound of Music. Archbishop Wolf Dietrich Raitenau built the main palace building in 1606 just outside the city walls for his love Salome Alt. Originally called Altenau Palace in her honor, it was re-built by later Archbishops in the 1700s and called Mirabell after its beautiful views of Old Town. Mozart used to have concerts in the Ball Room as a child which is now used for weddings. In 1815 Bavarian Prince Otto was born here and later went on to be the King of Greece. The palace has been owned by the City since 1866 and they use it for offices including the mayor. Garden Hours: While the main area is open all year from Dawn to Dusk, the Hedge Maze and Dwarf Garden close each Winter. Featured On: (Sound Of Music Movie Tour). About The Trick Fountains: Many people come to Hellbrunn Palace to seek out the Sound of Music Gazebo, but the Trick Fountains are not to be overlooked. If you have kids with you, the Hellbrunn Fountains will be the most fun thing they do in Salzburg. The fountains are only available as part of a 1 hours long guided tour but is a very memorable time. You will learn the history of the grounds as you pass through grottoes, ponds, and walkways all filled with trick fountains that are out to get you. You won’t get totally soaked, but will get damp and you’ll have a great time. No list of the top ten things to do in Salzburg if ever complete without the Trick Fountains. Your ticket for the Trick Fountains tour also lets you tour the inside of the Hellbrunn Palace itself which is pretty fancy and has some amazing ceilings. Meaning Mouth of The Spring, Hellbrunn Palace was built by Prince Archbishop Sittikus in 1613–19 as a day time retreat on the site of an old hunting lodge from the 1400s. Like the trick fountains, the Hellbrunn Palace was really made for fun and was built with ZERO bedrooms. The vast wooded grounds of the estate were settled as early as 500BC and have had a large villa since Roman times. Fountain Hours: The Trick Fountains have tours from 9am-9pm in the peak season but are closed for Winter from November-March. If they were able to be open all year they would be in our top 5 things to do in Salzburg. Featured On: (Other Top Salzburg Sights). About Residenz Square: The heart of Old Town Salzburg is the large Residenz Square which holds a few of the towns best sights. Centered around the 45 foot tall Horse Fountain (Residenzbrunnen), carved in 1656, there is always something going on in the Square. From Christmas Market stalls to carousel rides, and fireworks, Residenz Square is the place to be. The West side of the Square holds the popular Old Residenz Palace built as a mansion for Salzburg’s Archbishop in 1596. In order to build the palace and lay out the square, he had to tear a bunch of Medieval homes and a cemetery which themselves had been built on a Roman forum. The palace complex has elegant staterooms that are lavishly decorated plus a classic art gallery that has Rembrandts and Rubens. In 1602 the Archbishop built the New Residenz (Neugebäude) on the East side of the square to serve as his guest house. The building is home to the Glockenspiel Bell Tower, Heimatwerk Shop, and the Salzburg Panorama 1929 painted by Johann Michael Sattler. The Panorama boasts a series of stunning 360-degree panoramic paintings of many European cities made during the early 1800’s. About Salzburg’s Beer Halls: Just 90 minutes from Munich, Salzburg is home to its own great collection of beer halls. 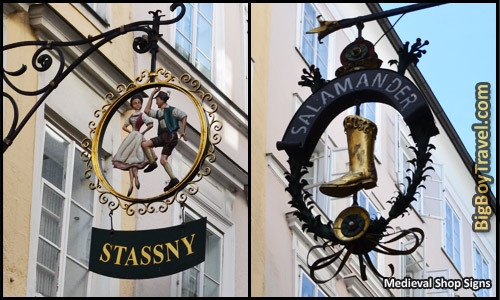 The most popular beer hall for travelers and our personal favorite is the classic Augustiner Bräustübl Tavern. This 1,500 seat beer garden and hall was opened in 1621 and is attached to a monk’s brewery. The monks came here from Munich where they first established the brewery in 1328! The beer is drawn from wooden barrels on a self-service basis and food is also available. The Beer Hall that locals seem to recommend the most to us is the historic Stiegl Brewery opened in 1492. Located on the South side of Mönchstein Hill, Stiegl is the largest brewery in Austria that is still privately owned. While the main brewery has a beer hall and museum we like their Stieglkeller location right below the High Fortress even better. Here you can sit on the patio overlooking Old Town or go in the hunting lodge interior of Beer Hall which makes it a very authentic place to grab a drink. Sternbraeu on the West side of Old Town also has an outdoor beer garden and can be quite enjoyable. About Biking In Salzburg: With miles of paved bike paths in and around town, one of the best ways to tour Salzburg is on two wheels. It is pretty endless where you can go as the city is littered with Mozart and Sound of Music sights easily accessible by bike. We love following the paths along Salzburg’s river to relax. Within a few a short distance of town, you can bike to Alpine peaks and the village of Berchtesgaden is only 13 miles away. You can very easily follow our Old Town Walking Tour, Sound of Music Tour and Other Sights Page while biking. If you prefer a little more structure consider joining a guided bike tour with Maria’s Bicycle Tours (website). We usually just bike around at our own pace and almost every hotel will help you secure a bike rental. Many of the hotels even have their own bikes available for guests. About Winkler Terrace: Sitting on the top of Monk’s Hill (Mönchstein), you have to make a trip up to Winkler Terrace. A quick cliff-side elevator ride quickly gets you up to the terrace which provides a birds-eye view over Old Town Salzburg. The Terrace was where ‘Do Re Mi’ began in The Sound of Music. It’s not just the views that make Winkler amazing as it is also surrounded by a timeless fortified wall called Burgerwehr built in 1487 to protect Salzburg. As you work your way along the ramparts of the wall, you’ll see other defenses like the old Mülleggertor city gate built in 1280. Near the tower is the fabulous Castle Mönchstein which was first documented in 1350. The castle was nicknamed the Professor’s Castle when it was run by monks and now serves as an award-winning hotel. About Salzburg Cathedral: As the biggest church in Old Town, the Salzburg Cathedral (Dom) is large enough to face 3 separate town squares at once. The Baroque-style cathedral was finished in 1628 and has a 233-foot tall green dome. Before entering the church, take in the beautiful Virgin Mary (Madonna) Statue lying in the center of the Dom Square. While it appears odd that the statue is looking away from the church, further inspection reviles that the statue is actually interacting with the Church’s facade. As you approach the church it gives the appearance that Mary is being crowned by the statues in the background. Adding another layer to the Cathedral, it was also where Mozart was baptized. About Kapuzinerberg Hill: The hilltop has been settled since 1000BC and has housed monastery with monks since 1594. You will get amazing city views from the monastery and it is a good jump off point if you are hiking further up the hill o Franziskischlössl. In the 1600s, Franziskischlössl was built as a watchtower for the city wall and is now a restaurant. On your wooded hike to the top of the hill, you will cross multiple parts of the old Medieval city wall. The walls had been re-enforced following the 30 Years War which Salzburg managed to stay out of. About Steingasse: One of Salzburg’s best preserved Medieval lanes is the narrow Steingasse. For a long time, Steingasse was the only road stretching from the North over the Alps down to Venice, Italy. This was quite important as Salzburg was a main hub for salt and the route brought in a lot of money. The route also connected to the Medieval Lime Road which followed the Danube from East to West, greatly expanding Salzburg’s reach. We love the unique and aged doors on many of the homes on Steingasse. The most notable person to live here was Joseph Mohr in house #9 where he wrote the lyrics to ‘Silent Night’. Also, notice the broken corner where a US Army tank got stuck trying to get down the narrow road. Franciscan Church: Church with an amazing vaulted Gothic ceiling supported by a forest of columns. Nockstein Peak: Located on the North side of Gaisberg Hill, this is the most popular peak with local hikers. Puppet Theater: Historic theater with a lavish interior whose marionettes were featured in the Sound of Music. Salzburg Zoo: Salzburg has a great zoo, we just don’t like putting zoos on top ten lists as they are in every big city.